So we have been in Charlotte for 2 weeks now. I've been on a roller coaster of emotions that I did not even expect. One minute I have been thrilled and the next crying my eyes out. I can wake up excited and by noon I can be feeling really blue and ready for anything again by 4:00 in the afternoon. Then I can feel old battles creeping in on me again. One in particular is my feeling insignificant in this world. Almost obsessed with do I matter? Then I am just flat out angry with myself because, didn't I already conquer this demon? Haven't I put this lie to rest? I started this year tired of insulting Gods creation and I find myself slipping back into that pit. My mind bombarded with everything that is a mess inside or outside of me. "I'm not a nice person. I'm impatient. I'm too emotional. I have no gifts or talents. I am fat and old and ugly. I am good for nothing but taking up space. Who wants to be your friend." These messages pelting me like a never ending hail storm and leaving incredible damage. I keep feeling like why is this back? Why now? I waited for over a year for this move and now its here and I am this crazy emotional yo yo. My faithful God always seems to meet me right where I am at, this mess that I am. I had been asking God for a verse. A sword I could swing at the enemy. Something to keep my focus on Him and on truth. I listened to one of Pastor Steven Furtick's sermons tonight "Death by Distraction" that I had missed and near the end it completely absorbed me. 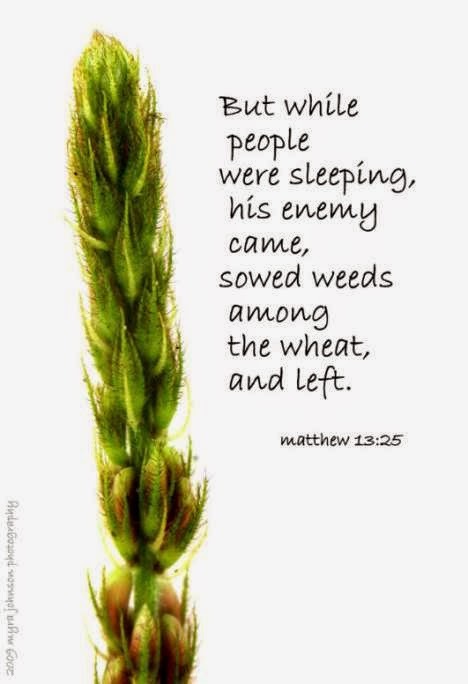 "But while everyone was sleeping his enemy came and sowed weeds among the wheat and went away." Pastor said the enemy will plant something next to God's seed to keep you from recognizing what God has put inside of you. And then he leaves and you focus on those weeds and you water those weeds and before you know it you are sabotaged. This was a wake up call. I need to tend my field. I need to dry up the water source to these nasty weeds. I want my mind, my joy and my peace back. Lord Jesus, as you sow your good seed into my life. I ask that I would be focused on you and your truth. Help me keep distractions at bay. Let the seed not be snatched away from me. Let it not be scorched but let it take deep root in my heart and spirit. Let it not be choked but let it sprout and bear fruit. I rebuke worry from my life, untrue interpretations of what may or may not ever even happen. Let me rest in your truth of what you say about me and the reality of what you put before me each day of my life. Fulfill my destiny in me. I know that moving can be a real trigger for insecurity. This is my 10th move since being married. I think it is all the 1st impressions that get to me. Anyway there is almost always a little depression. Its hard to feel outside of where you left and on the outside of your new place. It always gets easier, but I know where you are coming from.